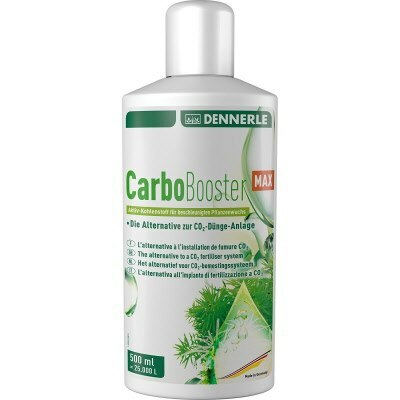 Dennerle Carbo Booster Max provides an alternative to a carbon dioxide fertilizer system. It provides an effective supply of readily available carbon to improve plant growth. This formula contains no other fertilizing ingredients. You will see an improvement in plant growth in just a few weeks. The better plants grow, the better their capability to combat algae. Carbo Booster Max can be utilized by itself or in combination with an existing carbon dioxide fertilizer system. It is harmless to fish and other inhabitants. 250 ml will fertilize 12,500 L (about 3300 Gal.) of aquarium water.